I have yet to meet a person who enjoys pain and suffering. Yet suffering is a part of the warp and woof of life. It is not a part of God’s original intent for creation. Since Adam’s first sin, pain and suffering have been an abnormal part of the cosmos. Suffering is an unwelcome guest who bullies his way to the table and makes demands – much like a soldier on a bloody battlefield. Keller introduces the problem of pain and suffering and explores some of the philosophical challenges that Christ-followers must understand and address. “Nothing is more important than to learn how to maintain a life of purpose in the midst of painful adversity,” writes Keller. Yet our culture has a tendency to respond to suffering in ways that are helpful and wrongheaded. The moralist response to suffering is to “do good.” The fatalist’s response to suffering is to “hang in there” and “endure.” The dualist response to suffering is “purified faithfulness.” And the secular response to suffering is focussed on “technique.” A combination of these erroneous responses to suffering litter the current milieu and produce a generation of confused and discouraged people. Part two provides readers with the theological muscle – a crucial part of the battle. Keller unpacks the doctrine of God’s sovereignty and provides a painful but biblical rationale for the role of suffering the lives of people. While Keller never attempts to provide a comprehensive answer to the problem of evil, his treatment of this thorny subject is some of the best in print. He may not satisfy the disciples of David Hume, Voltaire, or Sam Harris – but he does give ample ammunition for believers who are looking for honest answers. Parts one and two explore the philosophical and theological angles of pain and suffering. Part three helps readers with practical application. They are given practical tools for “walking with God in the furnace.” The very notion of walking with God in the furnace assumes pain – pain that some are unwilling to admit. But practical experience reveals that we live in a broken world; a world which has been torn to shreds by the consequences of sin. Keller urges readers to walk with God in suffering: “If you go into the furnace without the gospel, it will not be possible to find God in there. You will be sure he has done terrible wrong or you have and you will feel all alone. Going into the fire without the gospel is the most dangerous thing anyone can do.” So the gospel is the first and last defense of every Christ-follower; indeed it is the hope of the watching world. Second, the author stresses the importance of weeping during seasons of adversity. Elijah serves as an example of a man who cried out in great agony. He was a man unafraid of weeping. Such an approach is not only honest – it is a sign of emotional health. Third, Keller demonstrates the need for trusting in God during days of pain and adversity. Joseph is portrayed as an example of a man who trusted: If the story of Joseph and the whole of the Bible is true, then anything that comes into your life is something that, as painful as it is, you need in some way.” Jesus too demonstrated trust in his Father and points believers in the identical direction. Keller continues to alert readers to other tools that they should utilize during their dark days. 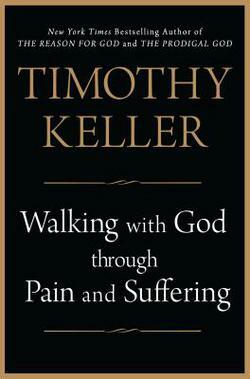 Walking With God Through Pain and Suffering is a watershed book that deserves to be read. Christ-followers will no doubt be encouraged by this Christ-exalting book; a book which drives readers to the cross of the suffering Savior.